Avira Connect is your personal online dashboard that allows you to manage all your devices (PC, Mac, Android and iPhone) as well as your licenses from one central location. Get an overview of the security status for all your devices at a glance, or locate a lost or stolen smartphone with the Family Locator service. 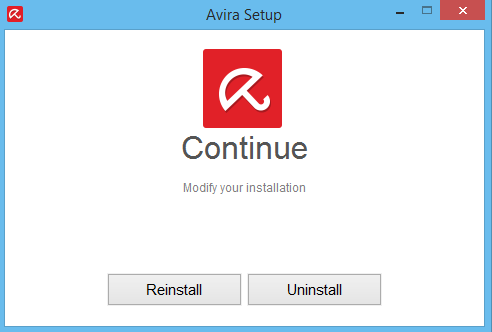 To be able to uninstall Avira Connect completely, it is necessary to follow the correct uninstall process steps in this page, if you have problem to totally remove it from PC, then read this detailed instruction to simply get rid of it for good. The procedure to uninstall the program differs depending on the operating system you are using, so you must follow the correct instruction below to uninstall Avira Connect step by step in accordance with the operating system you have. Let’s take a look how to do it in different systems now. Right click on the Hidden menu in lower right corner to show the hidden icons >> right click on the icon of Avira Connect to choose Exit. Hold Ctrl + Shift + Esc keys on the keyboard to open Task Manager. 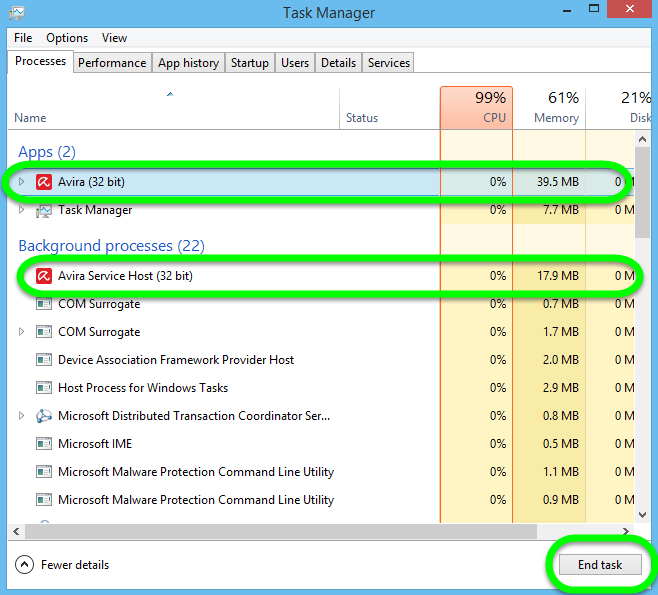 Then click on the related process: Avira & Avira Service Host, and then click End task. In Windows 10, this is done by clicking the Start button > then select Apps and Features > Then scroll down the cursor to select the “Avira Connect” you wish to uninstall > Click Uninstall button then click the popup Uninstall again > Confirm the request of the Avira setup with Uninstall > The Avira Setup will take some minutes to uninstall the product > Confirm the notification to restart your system with Yes > After the reboot of your PC the Avira Connect is completely removed. 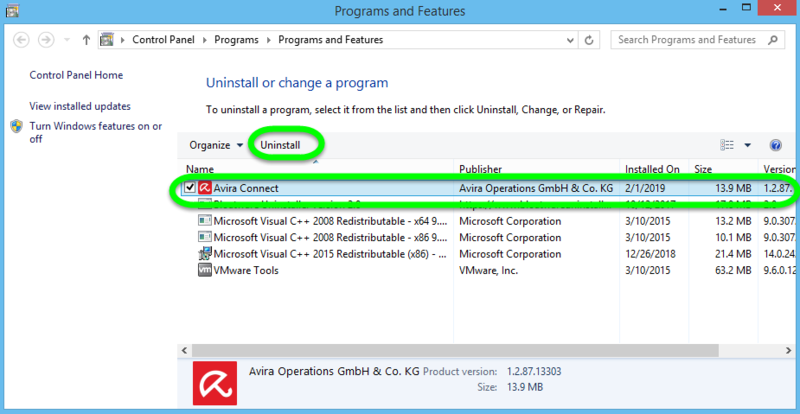 In Windows 8 / 8.1, this is done by clicking on Start button > then select Programs and Features > Then scroll down the cursor to select the “Avira Connect” you wish to uninstall > Click Uninstall button > Confirm the request of the Avira setup with Uninstall > The Avira Setup will take some minutes to uninstall the product > Confirm the notification to restart your system with Yes > After the reboot of your PC the Avira Connect is completely removed. In Windows 7 /Vista, this is done by clicking on Start button > then select Control Panel > click Uninstall a program link > Then scroll down the cursor to select the “Avira Connect” you wish to uninstall > Click Uninstall /Change button > Confirm the request of the Avira setup with Uninstall > The Avira Setup will take some minutes to uninstall the product > Confirm the notification to restart your system with Yes > After the reboot of your PC the Avira Connect is completely removed. Click on Start button in the lower left corner, type “regedit” in the menu search box and press Enter on your keyboard. 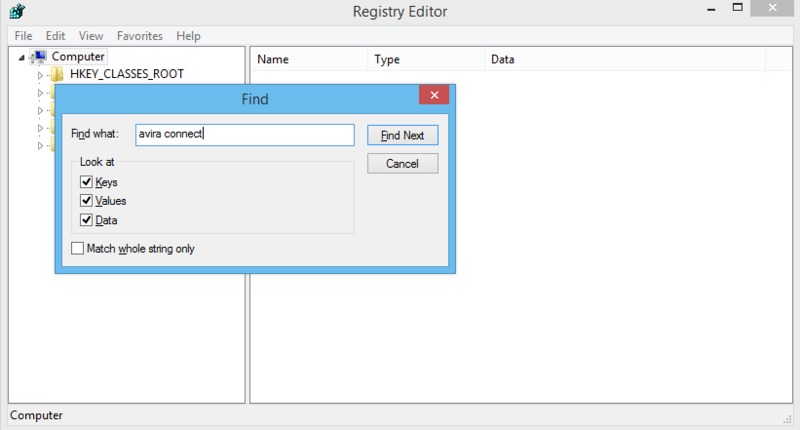 On the taskbar there is a Search Box, enter “regedit” to open the Registry Editor. On the navigator click Edit > Find…, and enter “Avira Connect” to search for possible remaining files, and delete them to completely remove Avira Connect, until the Finishing searching message appear, then you can finish. Press and hold Windows key + C on your keyboard to open the charms bar. Select Search, type “regedit” in the box, and press Enter key. 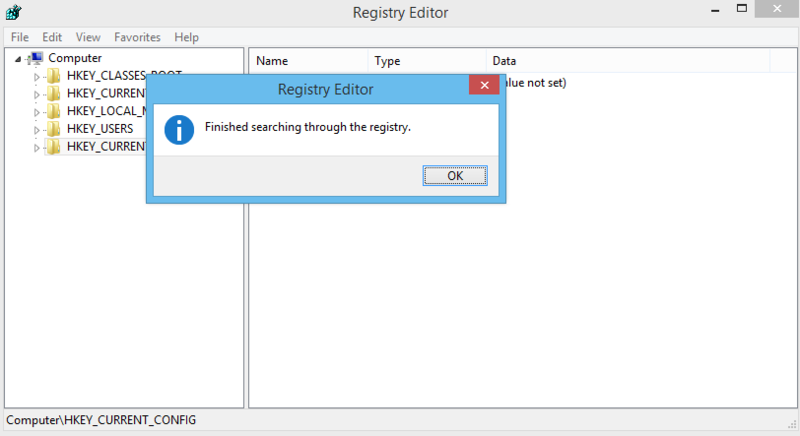 The Registry Editor will be opened with another window, on the navigator click Edit > Find…, and enter “Avira Connect” to search for possible remaining files, and delete them to completely remove Avira Connect, until the Finishing searching message appear, then you can finish. Click on Start button in the lower left corner, type “regedit” in the menu search box and press Enter on your keyboard. 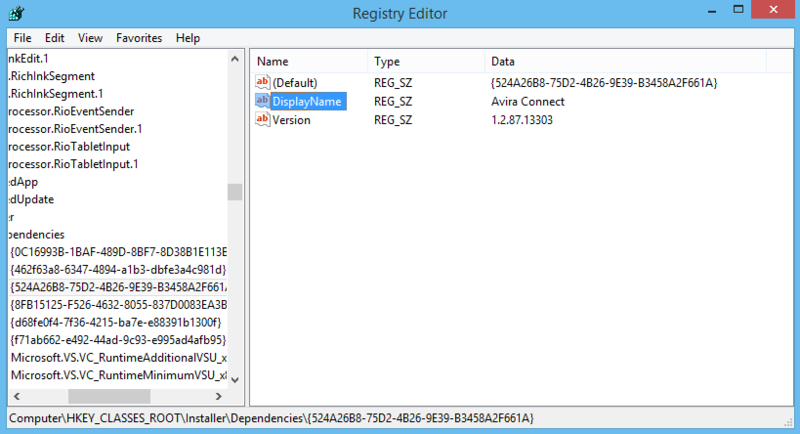 The Registry Editor will be opened with another window, on the navigator click Edit > Find…, enter “Avira Connect” to search for possible remaining files, and delete them to completely remove Avira Connect, until the Finishing searching message appear, then you can finish. Select Avira Connect (the target) you want to remove on the interface, and then click the button “Run Analysis” to continue. 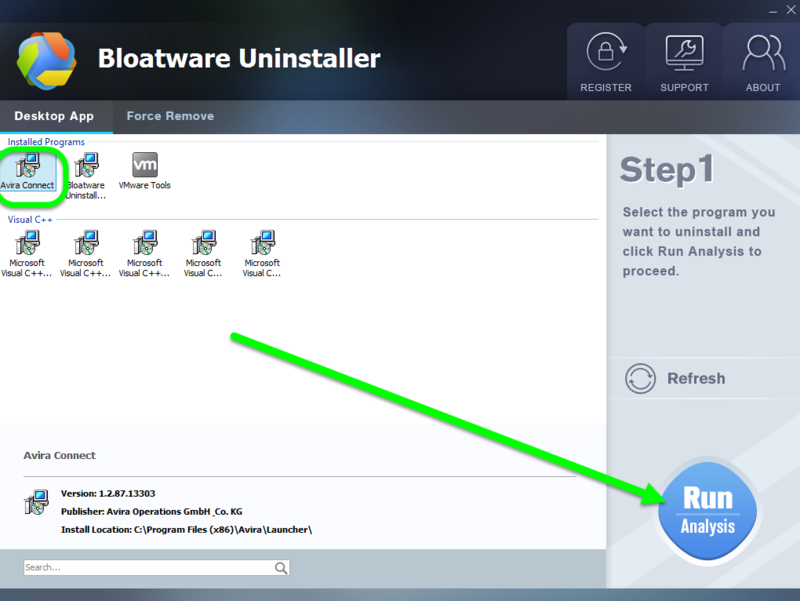 Click on “Complete Uninstall” after all the components are scanned out; Click Next, and follow the prompts to complete the removal until it Finish; select the No to reboot after the removal, and then click on Scan Leftovers to conduct a full scan for the program leftover after it lights up. Click on Delete Leftovers and then Yes in the pop-up confirmation dialog; After all the leftovers have been removed completely, click OK to end the process; Back to Step 1, you will find Avira Connect is gone, as well all the leftovers. 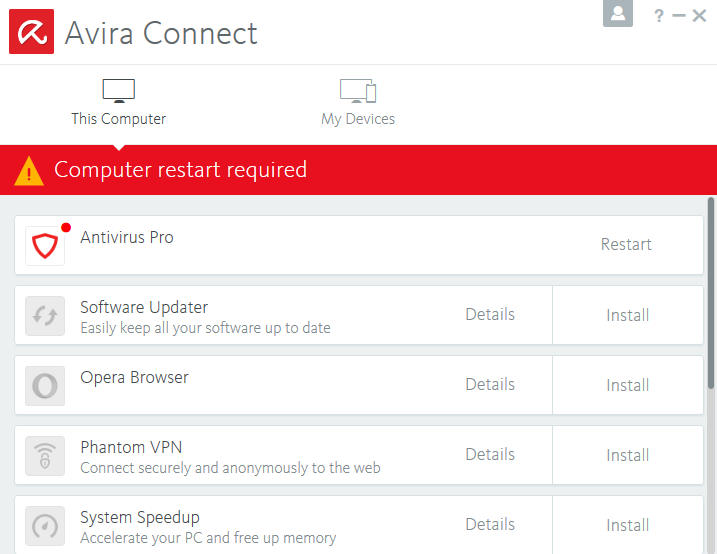 Now, you will find the target Avira Connect is still in the list on Step 1 when you back to the start, don’t worry, we will do it again with seam steps to completely remove Avira Connect launcher this time. After you have done with the three steps in Bloatware remover you will see the interface that popup with “Avira Setup”: select Uninstall to remove the target. Then you will receive the message of “Done”, meaning you have successfully remove it for good on this computer. How Can I Easily Uninstall Lenovo Energy Management?